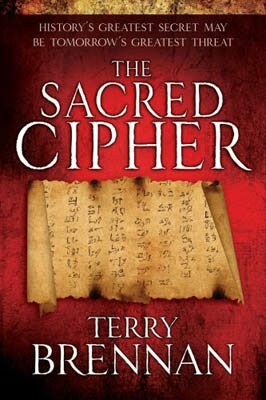 One of my most favorite FUN fiction reads last year was The Sacred Cipher, by Terry Brennan. I've already read and reviewed this book and I'd encourage you to go and read my review of The Sacred Cipher over at 5 Minutes for Books if you have not already done so. In a few little words: good, clean fun. I had a chance to ask Mr. Brennan some questions about the book and I'm posting this interview below. If you've already read the book, you'll be interested in our little exchange. If you haven't, then let it whet your appetite further! #1 - What gave you the idea and the vision for this story? There are two parts to the story. The first part is about a guy who finds an ancient document and then pulls together an eclectic assortment of people to help him identify and then decode the message on this document. The second part is about how this group then decides to go off and find out if the message on the document is true. It would be giving too much of the story away if I told you how I got the idea and the vision for the second part of the story – and that would be no fun for your readers. Let’s just say that my geo-political interest in a certain part of the world spawned a wacky idea that I filed away in my memory banks. I worked at, and lived in, The Bowery Mission in New York City for over a decade. One day I was standing in the back of The Mission’s chapel, looking up at the organ pipes high above the speaker’s platform at the front of the chapel. And I thought, “Wouldn’t it be cool if there was a secret room hidden behind those organ pipes?” Now, I knew what was behind the organ pipes … I had been in there many times. But it was that idea, coupled with the older idea I had gotten for the second part of the story, that became the outline for The Sacred Cipher when I put them together. #2 - Did you do any traveling in researching this book? If so, what is the most memorable experience you had when traveling for purposes of researching and writing The Sacred Cipher? Oddly enough, the longest trip I took in researching The Sacred Cipher was from my home in the far northwest corner of the Bronx to midtown Manhattan and the Humanities and Social Sciences Library on 42nd Street and Fifth Avenue, at Bryant Park. I did all of my historical research in that library – New York’s first truly public library and now the library system’s main research facility – except for the research I did on the Internet. The first half of the book is set in New York City, so that wasn’t a problem. For most of the scenes in the book that occur outside of New York City, I did my research using Google Earth and a whole assortment of maps other geographic resources. It’s amazing just how much information you can get from the Internet, and how much visual detail you can get from satellite photos. I did get introduced to an archeologist, by a mutual friend, who at the time lived and worked in Jerusalem and she was a valuable resource for archeological and political information about Israel. So, the most memorable experience I had in traveling for research was sitting on the steps of the Humanities and Social Sciences Library, eating an Egg McMuffin, and waiting for the library to open. My life is so exciting. #3 - What drew you to theologian Charles Spurgeon and what made you select and appoint him to have an integral role in the set-up of your story? Charles Spurgeon was a powerful figure in London in the second half of the 19th Century. He was not only the pastor of the New Park Street Church, but he published a newspaper called The Sword and the Trowel – a collection of sermons by Spurgeon and others, commentaries on the news and politics of the day, and opinions on how these things fit into or impacted God’s plan for man. It was well read and very influential in England at the time. Spurgeon’s London publication, The Sword and the Trowel, was replicated in New York City in 1878 by his cousin, Joseph Spurgeon, as The Christian Herald and Sign of Our Times. Dr. Louis Klopsch purchased the magazine in 1890 and was instrumental in preventing The Bowery Mission from closing its doors, purchasing the rescue mission from Rev. A.G. Ruliffson in 1895 after its original superintendent passed away. So, through Joseph Spurgeon, Dr. Louis Klopsch and The Bowery Mission had a connection with Charles Haddon Spurgeon. How close a connection is not known. But I used that possibility as the vehicle for getting this ancient document into Klopsch’s hands and, ultimately, into the hidden, secret room at The Bowery Mission. #4 - You mentioned that your wife was very supportive as you wrote this story, offering you encouragement and advice as you went along. How long did it take you to write this book? I know a lot of potential (hoping-to-be-published) authors also blog. If you don't mind sharing with our audience, under what life circumstances did you write The Sacred Cipher? Essentially, I wrote The Sacred Cipher in a year of Saturdays. Throw in some vacation time, or late nights – but it was essentially a year of Saturdays. At the time I was working my full-time job as Vice President of Operations & Administration for The Christian Herald Association, the parent organization of The Bowery Mission and three other ministries in New York City. My wife, Andrea, was gracious enough to allow me that time. We lived in a small apartment in The Bowery Mission, and I would close myself up in a small corner of our bedroom, where my computer was, and work from early morning, often until well into the evening, on every possible Saturday. So, it took me a year to write the book, another year to secure an agent who was willing to represent me, another year for the agent (Rachelle Gardner of WordServe Literary) and I to secure a contract with a publisher (Kregel Publications) and then almost another year to work on editing and marketing preparations for the book. #5 - Ok, ok, maybe you've been asked this before but I've got to know - is there a sequel in the works? I am currently at work on the sequel to The Sacred Cipher, a book tentatively titled Scorpion Pass, which picks up directly where The Sacred Cipher ended and continues the story – I hope with some rather interesting story elements and plot shifts. I don’t have a deadline for completion, but I’d like to have the first draft completed before our daughter gets married on June 5. Kregel Publications has an option on the sequel, but it still has to pass muster. Thanks for the opportunity to share this with your readers. TO WIN AN AUTOGRAPHED COPY OF THE SACRED CIPHER, SIMPLY LEAVE A COMMENT BELOW. THIS CONTEST IS OPEN TO U.S. RESIDENTS ONLY! THE CONTEST WILL REMAIN OPEN THROUGH THURSDAY, APRIL 8TH. And the fun continues today.....keep watch! This book sounds great ~ please enter me! What did I learn from reading your post? Well...the book was written in a year of Saturdays while the author held a full time job; he did a lot of historical research in a NY library in Bryant Park. Okay, Spurgeon in a suspense book? Sounds very intriguing indeed! Gotta love that a good local library (and a little Internet) is all you need to do research these days! It's cool that a sequel is in the works and that all his travel was done very locally for research. WOW! This one looks really good! Pick me!!! This sounds like just my thing!!! Please enter me for the giveaway...I love that the author got all of his geographical information from the internet!?! And I didn't even realize that Charles Spurgeon plays an important role in the book...that makes it even more exciting! You have a loving, patient wife to give up so many Saturdays. I guess that's good for us. I'm amazed at the amount of time authors spend in research to make their books real. Thank you. I would love to read your book. Please enter me. Thanks. I've wanted to read this for a while. Please enter me. I love it when authors talk about their inspirations for their stories,as in, I saw this, and thought what if? I would really like to read this book. I would love this one too! After you reviewed it, i added it to my "to read" list. This would help :). I am so glad that you are sponsoring this giveaway,I have really been hunkering to read this one. This book has been on my TBR list for awhile, so please enter me! I'm interested in the book! I'd like to read this one. I learned that Spurgeon is a character in this suspense novel, and that's what sold me. That, and the fact that you liked it, Carrie. Wow, Carrie, what a great blog you have! I'm glad I found you thru Monica @ the homespun heart. Terry's book sounds terrific. I'm glad to be reminded of it. I first read about it on his agent's blog last year. I learned from reading this post that Terry had a lot of drive, determination and passion for this project. Written in a year of Saturdays while holding a full-time job---Wow! Also, this book sounds like it's chock-full of historical details. I'd love a chance to win. I'm looking forward to looking through the rest of your neat blog. i love that authors are using new technology to write about ancient history and places- ie using google earth like the author did! pretty cool! thanks for offering the giveaway-book sounds yummy! I did not know that Spurgeon's Sword and Trowel had an American counterpoint. This novel sounds very interesting since it combines mystery with figures from church history - two of my favorite subjects! Thank you for the interview. I would love to win and read The Sacred Cipher. I would love to read this book! Thanks for the chance to win a copy. This book sounds so very interesting. I would just love to read it. Please enter me. Thanks!